The Boondock Saints may not be the most instantly recognizable film out there, but it’s got a very loyal following and for good reason. Fans will know full well just what an enjoyable, wild, Tarantino-esque, action romp it is, but unfortunately, critics didn’t quite see things the same way, as they panned it upon release. In the years since, though, it’s gone on to become a firm cult classic and even spawned a sequel in 2009. Admittedly, the second outing was a far cry from the first, but it had its moments and ever since, people have been crying out for another tale featuring vigilante twin brothers Connor (Sean Patrick Flanery) and Murphy MacManus (Norman Reedus). At this time, there’s very little to go on in regards to Origins. No network, or streaming service, has been announced, nor do we know who will be writing, directing or starring in the series. As of now, all we know is that it’s happening, and that the tale of the MacManus brothers will live on though television. A DVD and USB Flashdrive Digital Download of Season One of The Boondock Saints: Origins, Commemorative Production Booklet, Limited Edition Signature Pennies, Baseball Hat, Sticker Set, Wall Decal, Temporary Tattoo Sheet, Bandana, Buff, Patches, Coldweather Beanie, 9” Lady Justice Polyresin Statuette, Lady Justice Bottle Opener, Shot Glass Bar Set, Flask, Official and Alternate Image posters (x2), Metal Cross Keychain, Motorcycle Club Kutte Patch Set, Fun Shapes Ice Cube Tray, Griffin Irish Whiskey Tumbler Set (of 2), Rosary Beads, 2018 Wall Calendar (13 Month), Playing Card Deck and Brothers 8″ Action Statuettes (2 pieces). You can find more information at BoondocksBack.com, but honestly, we can’t imagine anyone spending that kind of money on something like this. Diehard fan or not, $600 is a ridiculous asking price for what amounts to not much more than a bunch of random merchandise. Most of which you probably have no use for. 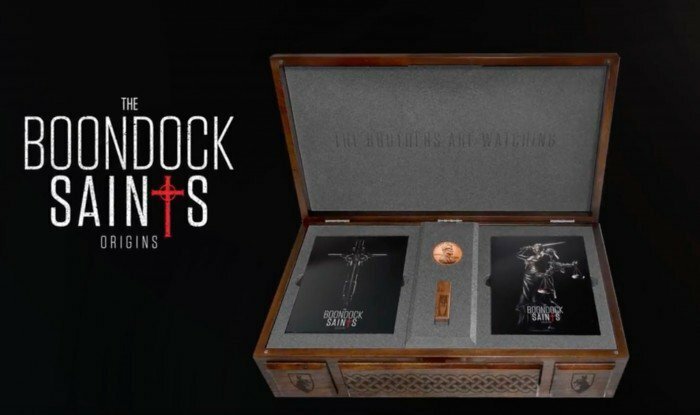 Regardless, it is exciting to hear that The Boondock Saints is being resurrected, even if it’s for television and presumably without the original cast. The first film stands as one of our favorite cult classics and with Duffy on board for Origins, we’re intrigued to see it start to take shape and find out just how it’ll flesh out the story of the MacManus brothers.